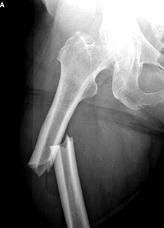 As a Fosamax Femur Fracture attorney, I am providing this update regarding Fosamax Femur Fractures. There are now many Fosamax femur fracture lawsuits filed by folks who have suffered a femur fracture or other bone fracture after taking the osteoporosis drug.The FDA added warnings about the risk of bone fractures from Fosamax and other bisphosphonate medications in October 2010, requiring drug makers to warn consumers that they should seek immediate medical attention if they experience new groin pain or thigh pain while taking the drug, which can occur weeks or months before a complete fracture of the femur on Fosamax occurs. The Fosamax bone fracture lawsuits allege that Merck failed to adequately research their medication or provide adequate warnings before they suffered a femur fracture or bone break. Merck has asked the U.S. Judicial Panel to centralize and consolidate the Fosamax bone fracture litigation in the U.S. District Court for the District of New Jersey, where most of the cases are currently pending and where the drug maker has its headquarters. Bone fracture lawsuits were excluded from the prior Fosamax MDL, which was established in August 2006 for claims filed by individuals who suffered decay of the jaw bone from Fosamax. A popular osteoporosis drug, Fosamax® and its generic form Alendronate®, is implicated to cause spontaneous fractures.Fosamax® is a drug used to strengthen bones, for many women it has worked successfully but according to medical reports, women who have taken the drug for five years are at risk of suffering spontaneous fractures. Fosamax and the following drugs Actonel (risedronate sodium) tablets, Actonel with Calcium (risedronate sodium with calcium carbonate tablets), Atelvia (risedronate sodium) delayed-release tablets, Boniva (ibandronate sodium) tablets, Fosamax (alendronate sodium) tablets and oral solution, Fosamax Plus D (alendronate sodium/cholecalciferol) Tablets, Reclast (zoledronic acid) Injections are now required to have clear warning labels regarding low-energy, or low trauma fractures of the femoral shaft (leg bone). As a Fosamax medication attorney, I suggest discussing this drug with any elderly female friends and relatives as they may be unaware of the current crisis and the FDA’s warnings. Doctors are seeing many femurs fractured in patients who have been on the drug. If you have taken Fosamax® or its generic form Alendronate® and believe to have been injured as a result, please fill out the form below to contact a Case Manager. Information and commentary provided by Dallas Fort Worth Personal Injury Attorney Dr Shezad Malik. The Dr Shezad Malik Law Firm can be contacted in Dallas toll free at 888-210-9693. If you or a loved one has been injured from a Femur Fosamax Fracture, please fill out our contact card for a free consultation.